Over the past several weeks, I’ve shared some of the workflows I use to publish Initial Charge. Push to Ulysses, Push to WordPress, and Upload Image are now essential tools in my arsenal. 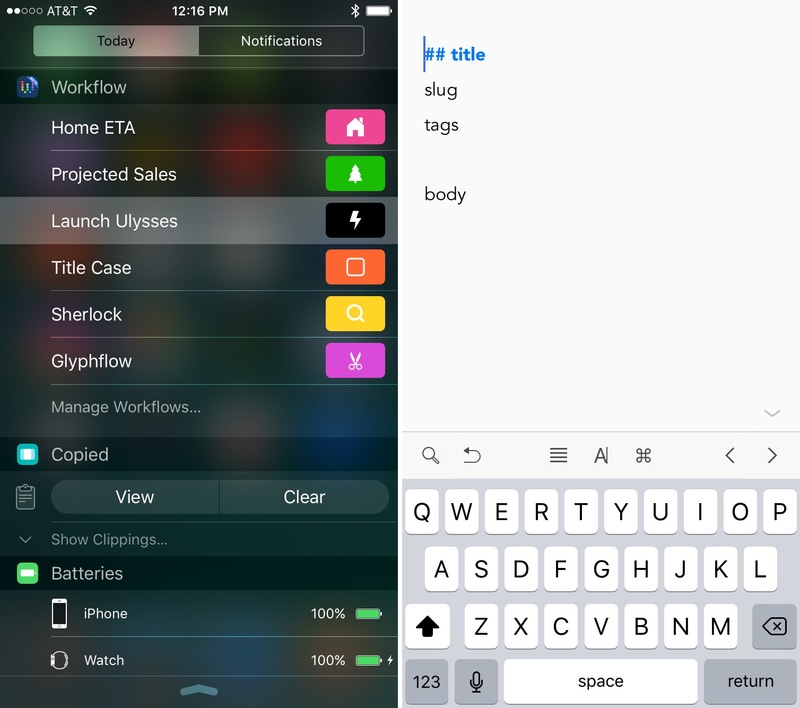 They streamline the writing process and help me get it all done in Ulysses for iOS. The workflows I’ve previously shared cover the composing of links, publishing, and image upload process. But this is only the beginning. Today I’ll be sharing the workflow I use to start every feature article published on the site — Launch Ulysses. And my plan is to share at least two more workflows over the coming weeks, alongside updates to those I’ve already published. The primary reason for building Launch Ulysses was that I wanted a consistent template for all of my articles. This allows for more complex automation when I get to the publishing process and maintains a familiar writing environment regardless of post type. Push to Ulysses handles that job when I’m composing links, but most of the longer-form articles I publish don’t start from a single webpage as inspiration — they usually start from notes in Simplenote or an idea in my head. When I was first designing this workflow, I was pairing it with the original version of Push to WordPress — as it’s currently published. This meant the entirety of my template consisted of the title on the top line, with Markdown-style header 2 formatting, and the body text at the bottom. But a lot has changed since then. Shortly after publishing my Push to WordPress workflow I made some major improvements. The workflow no longer asks for the URL slug, tags, or post type; it asks for the publish date; and doesn’t launch the WordPress dashboard upon completion. I plan on sharing the new version in the coming weeks, but given that Launch Ulysses and Push to WordPress are designed to work together, it’s important to offer more context as to why the template looks the way it does. The current template I use for composing feature articles consists of the title on the first line — wrapped in Markdown-style header 2 — the URL slug on the second line, tags on the third, and the article contents at the bottom. Upon publishing, the updated Push to WordPress workflow is capable of grabbing the title, slug, tags, and content as well as determining the post type and handing all that information to WordPress for publishing. It’s quick and streamlined, I can’t wait to share it. 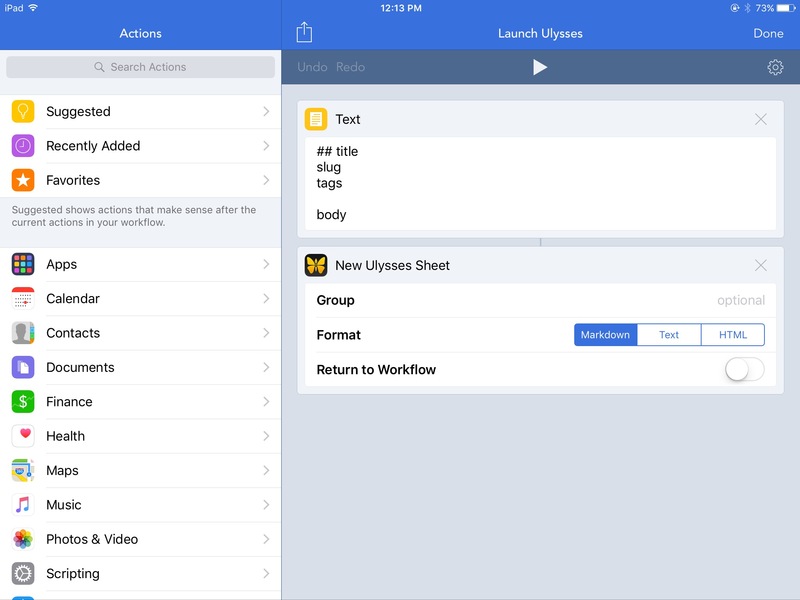 There was one other major change that took place since the originally design of Launch Ulysses — Workflow 1.5. This was a fairly substantial update with a completely rewritten workflow composer, faster workflow loading, and twenty two new actions. The most important new feature, though, was Ulysses integration. This means I can create a new Ulysses sheet in Workflow without having to jump through hoops with X-callback-URL. A text action which contains my feature article template. Workflow creates a new sheet in Ulysses with the template as its contents. Workflow 1.5 greatly simplified this workflow. I previously had to URL encode the template, save it as a variable, place it inside Ulysses’ X-callback-URL, and then open the URL to mimic the function of Workflow’s New Ulysses Sheet action. Using Workflow to interact with Ulysses is so much easier now. And the best part about this workflow is that it can be easily molded to your specific needs. Modifying the text action allows you to create new sheets at will that contain exactly what you want. Whether it’s the template for publishing online, taking notes in class, or creating a journal entry, this workflow can help you accomplish that goal.